LUCKY SEVERSON, correspondent: This is the Orchard Church in Oxford, Mississippi. It’s a Methodist congregation with a diverse membership. As the sign at the bottom of the hill says, everyone is welcome. Well, not everyone. This is a very welcoming congregation, but folks here, like many parishioners across the US, are a little jittery about unwanted guests. Pat Ward is the lead pastor. PAT WARD (Lead Pastor, The Orchard): We have been under an epidemic in our country lately of mass shootings, and it's been a lot in the news in the last few years, and we have had several who have said, "Hey what is the security procedure here?" SEVERSON: So the pastor and his advisors, which included David Waddell, appointed a security team. 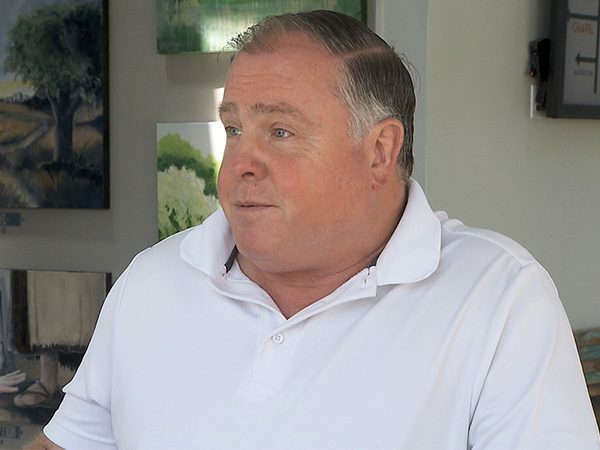 DAVID WADDELL: We have people that are looking for folks that may be looking suspicious or that would be questionable, just to kind of keep an eye on. SEVERSON: Are they carrying concealed weapons? WADDELL: They are, but they're—well, they're hidden. But yes, they have. SEVERSON: Those carrying weapons at Orchard are regular law enforcement officers and also church members. Mississippi has a new law called the Church Protection Act, which says churches can designate and train certain members to provide armed security with legal protection. 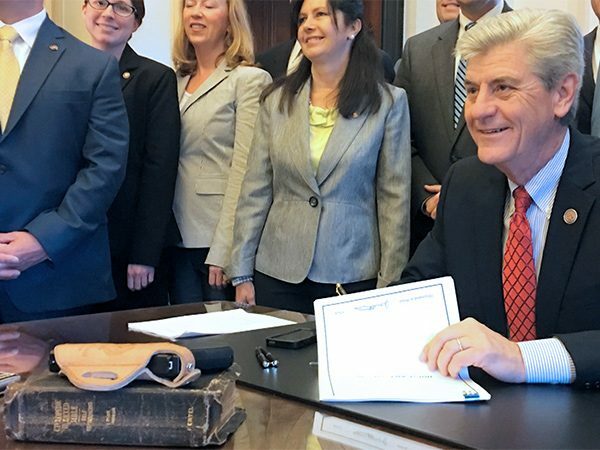 You’ll notice the governor’s gun on top of the Bible when he signed the law. Ann Whitaker was not impressed. She’s the associate rector at Saint Peter’s Episcopal Church in Oxford. REV. ANN WHITAKER (Associate Rector, Saint Peter’s Episcopal Church): I believe that it was a knee-jerk reaction to the shootings in South Carolina that happened one year ago. 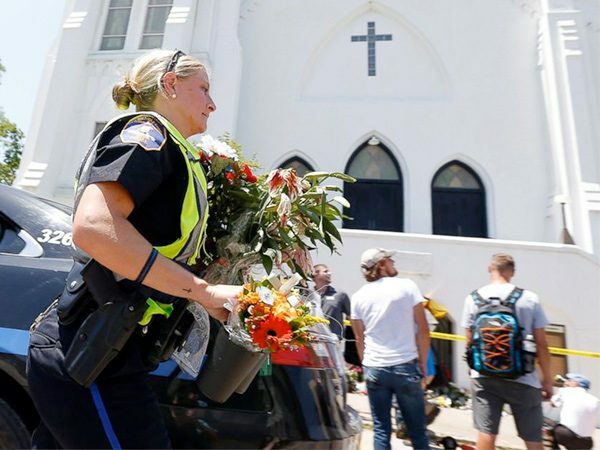 SEVERSON: She is speaking about the cold-blooded shooting in 2015 of nine members of the Emanuel African Methodist Episcopal Church in Charleston, South Carolina. For many churches this was a wake-up call. But there have been others: the fatal shooting at the Keystone Fellowship Church in Pennsylvania this year; the Sikh temple shooting in 2012 that killed six. There are several estimates of the number of people killed in church violence. Most range around 450 since 1999, but the FBI cannot confirm a number. This is Jay Losher, the co-pastor of the United Christian Parish in Fairfax, Virginia. REV. JAY LOSHER (Co-Pastor, United Christian Parish): After the incident in Charleston there were congregants who were saying that we should begin to think about it and have a plan for—God forbid that it would ever happen, but we should be prepared. SEVERSON: The Fairfax police crime prevention unit offered to help them prepare. The unit joins numerous private security experts advising churches around the country. Fairfax police call their church outreach program Worship Watch. 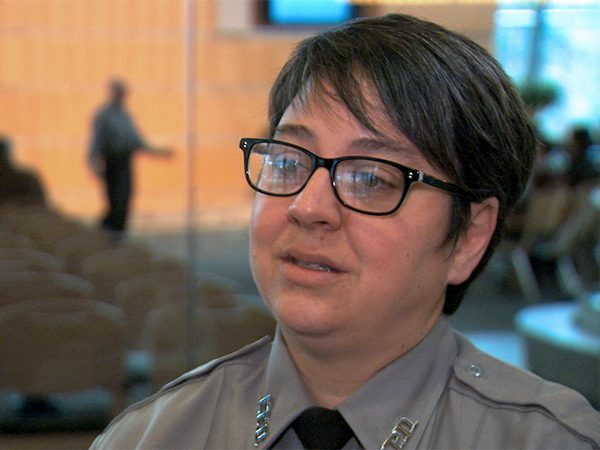 OFFICER KATY DEFOE (Fairfax County Police Department): We know that churches are open, and people—it's a welcoming place, and the congregation wants people to come in that need services, that need help, that want to be a part of the worship community. SEVERSON: Nationwide, the most reported church crimes do not involve violence. Officer Defoe says the most common problem she’s encountered is panhandling, which sounds innocent enough but, she says, can get out of control. DEFOE: Does it happen? Yes. Do they report? Not so much, because what they tell us is, you know, we took care of it, or the person needs help and not the police. But, unfortunately, it only takes a small—it’s a very thin line between okay and have a problem. SEVERSON: Jamie Rim and David Lee are deacons at Christ Central Presbyterian Church. JAMIE RIM (Christ Central Presbyterian Church): I just want to make sure that there’s a balance between security and securing our facilities and making it a welcoming house of worship—but also be aware of things that can affect our church security. 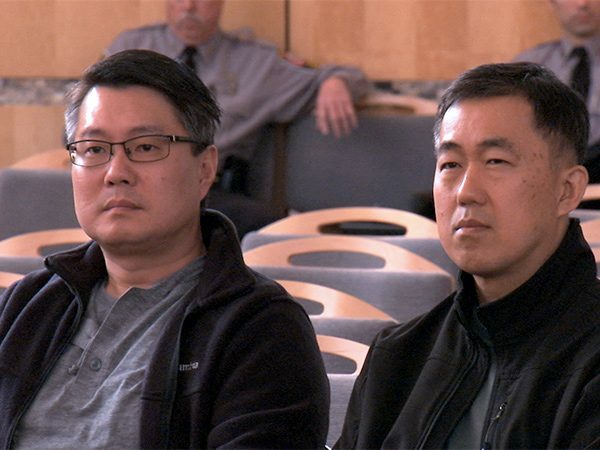 DAVID LEE (Christ Central Presbyterian Church): On the one hand, we’ve got to protect our congregation and ourselves. However, how do you really do that if someone enters our facility with intent to do harm, other than call 911 right away? It’s not clear how do we go about doing things. SEVERSON: Pastor Ward says his church just took common-sense steps to prepare. 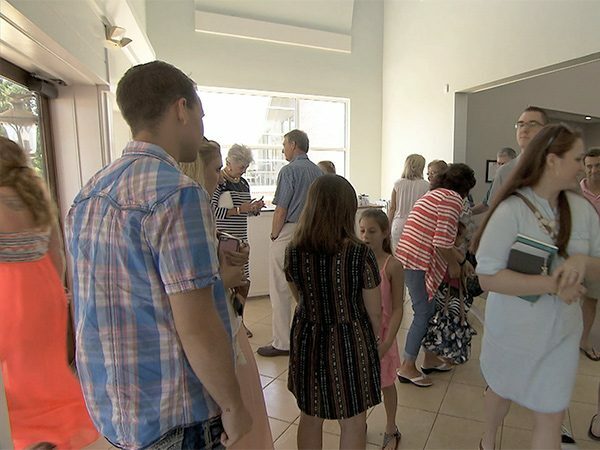 WARD: Things like limiting the number of entrances on a Sunday morning after the service starts to making sure that our children's ministry has a check-in procedure and check-out procedure. We also knew that we needed to work with the people who were greeting people at the door. We need to search bags that come in, some of our law-enforcement agencies said that's something that's been consistent in a lot of the shootings that have happened is that people will have carried bags. SEVERSON: Members here are very aware that this past Easter, 70 miles away in Memphis, Tennessee, police arrested a heavily armed man as he walked into Bellevue Baptist Church, where 4500 people were worshiping. The church had surveillance cameras. WADDELL: This has just made churches aware of the fact that not everyone will respect a place of worship. And we're finding that in a variety of areas in our country, so the smart ones are actually preparing for it and taking steps to help prevent anything from major or catastrophic happening. SEVERSON: Members here support the security steps taken so far, but only so far. This is Cindy Howle and Bob Plants. CINDY HOWLE (The Orchard Oxford): You walk a really fine line with religion and accepting people, to where do you draw that line where safety is? BOB PLANTS (The Orchard Oxford) I remember living and growing up in this town at that point, and you just didn't think about things like that. I have to think it's probably a media deal. We have so much access to information than we've ever had in the past, and sometimes I think that blows it out of proportion. HOWLE: One of the things I really enjoy the most about this church is the feeling of acceptance. I can put on a pair of jeans or a pair of leggings and not my Hollywood look. I wouldn't want someone saying, you know, "Did she wander in off the streets? I mean, she looks a little haggard”—that kind of thing. 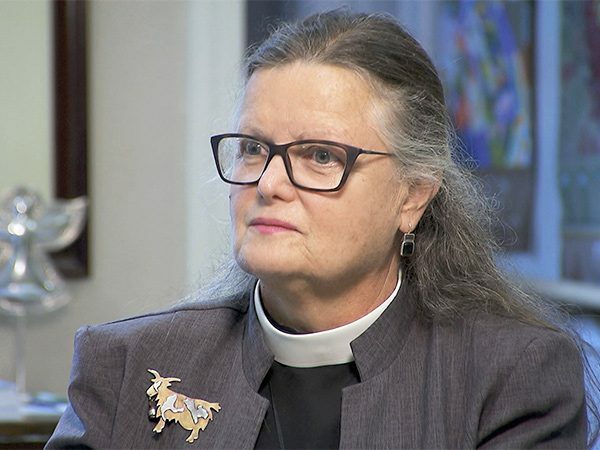 SEVERSON: Over at Saint Peter’s Episcopal Church, associate rector Ann Whitaker says her church doesn’t have a gun policy—that it’s up to the local denominations. But if it were up to her, guns wouldn’t be church. WHITAKER: There are guns in Mississippi, We have a lot of people who hunt, and that's okay. But I think in the house of the Lord, if you will, that is not a place where weapons should be acceptable. I think we have to look for other ways to sort of deal with what might happen within the confines of a church. SEVERSON: It’s not that she doesn’t occasionally think about an intruder coming in the church when she’s there alone. WHITAKER: I also think if I live into the tenets of my faith, while I want to be prepared, I take Jesus at his word, who says, “Be wise as serpents,” and follows up with the words “but gentle as doves.” It means I'm not going to live in fear. I don't want to live in fear. WADDELL: I think the overreaction aspect is an important one that we have to deal with if a church is going to be a welcoming place. It's going to be difficult if you've got a well-armed militia lineup up in the parking lot. SEVERSON: Pastor Ward says he thinks the measures his church has taken go far enough. WARD: One of my favorite verses that I feel like is related to this subject is in Luke chapter 22, where Jesus is in Jerusalem under the threat of death, and the disciples say, "Hey, we have two swords here," and Jesus says, "Well, that's enough." And it’s about—he didn't say, "No, we don't need any swords." He didn't say, "No, we need 12, and a big one for me." He just said, "That's enough." And I think an appropriate measure for security is what a church should wrestle with. 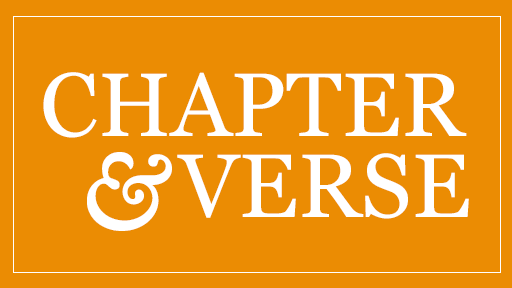 SEVERSON: For Religion & Ethics NewsWeekly, I’m Lucky Severson in Oxford, Mississippi. Churches and other houses of worship have traditionally kept their facilities open, even when worship services are not taking place. 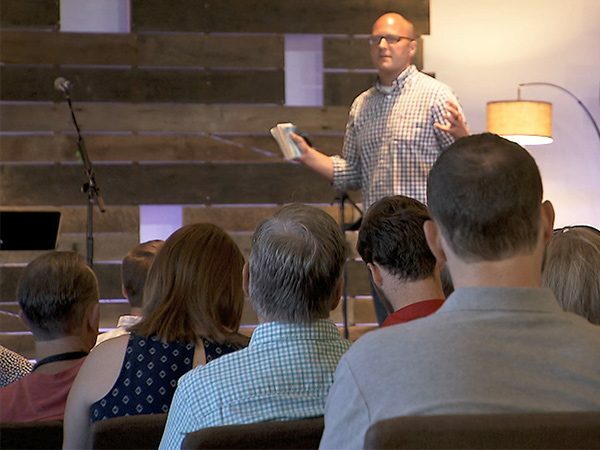 But recent shootings and incidents of gun violence have prompted some congregations to reassess how they can remain open and welcoming while still keeping members secure. 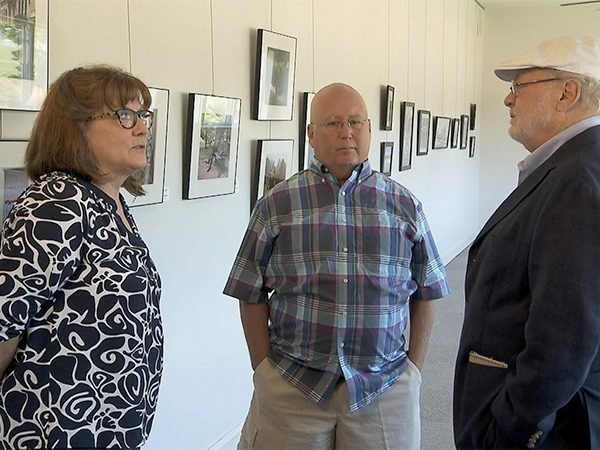 Correspondent Lucky Severson reports on the issue and speaks with clergy, laity, and police in Fairfax, Virginia, and Oxford, Mississippi.